Fall is here. It is my favorite season of all. I love all the colors changing, the temperature and the weather and most of all I love the sports and extra play time we get outside. Well along with sports and playing we get stains right? Stained from playing football at school, stained from raking up leaves and jumping in them, playing in puddles etc. That's where Shout comes in with their laundry cleaners! 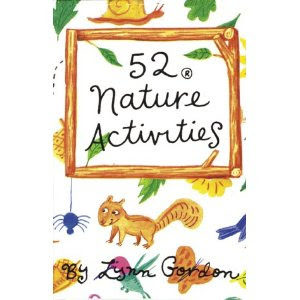 I received 3 great items from Shout along with the 52 Nature Activities Flash Cards. I got all these lovely items! The Shout Color Catcher, Shout Advanced for heavy duty stains and the Shout Triple Acting Cleaner. I love them all. The color catcher is great for dark loads. Sometimes I throw in a white shirt with a dark print on it or dark contrast sleeves, well I don't want it getting stained blue from our jeans so I throw in one of these, I also throw one in EVERY LIGHT LOAD in case something dark got in. Don't want to risk it. The shout triple acting spray has worked wonderfully on Avery's grass stained jeans. It was no problem. I sprayed it on, rubbed it in, threw in the wash and went on my way. The Shout Advanced has been great for Avery's muddy socks. She snuck outside the other day in the rain and I told her not to, well she started running in our puddles and we got muddy socks. This was awesome. You squeeze the gel onto the stain and rub it in with the included scrubber, let it sit a few minutes and wash. You can't even tell she was in the mud earlier that day. Seriously it was great! Also the triple acting has been great on Spaghetti as well. These products are great. The 52 activities has been great for our warmer fall days, we go exploring in our neighborhood, there are some great ideas in there. Avery isn't too outdoorsy so this is really helping us get out and get her ideas without her getting bored. I'm very happy with these items and I know they will make our fall play stains one less thing to worry about! I was sent all these from Growing Tree Toys they have Learning Toys among many other different types. They have all the toys that your child could want or need, even outdoor toys that will help get them dirty just so you can try out Shout products!